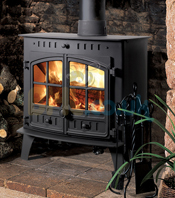 New to the Hunter range of stoves is the impressive Herald 80B, a large wood burning stove with an exceptional heating capacity, suitable for large properties. The Hunter Herald 80B multi-fuel stove has been creatively designed to combine the latest in stove technology with traditional good looks and values. Very happy with our purchase and meets our needs and adequately heats our 11 radiators and large hot water tank very well. We bought the additional thermostat which never worked properly so it was removed and we are happy with the controlability. It has been in use almost constantly and the pin in door hinge is slightly loose. The ash pans are good but a build up of ash colects at the sides and has to be removed with shovel.Airwash system is ok but have seen better. Overal a fair buy from limited options for the size of central heating we required. We had spent months studying the details of various multi-fuel stoves to make the best decision we could about the ‘stove’ that would be adequate for our home use, for hot water and central heating for 10 radiators. When it arrived, although we had measured etc. the size of the stove seemed enormous, and the plumber and my husband could NOT lift it into position. It was a 3 man job to put it in place! EVERY MINUTE OF THE STRUGGLE WAS WORTH IT. My husband says it’s a labour-of-love to deal with, because it has far surpassed our expectations. The thermostat we added works well, and we don’t have to heap up a ‘Big’ fire to ensure sufficiency for plenty of hot water and a warm house. We use smolkeless fuel (ovoids) and sometimes burn logs. Both work well. It is situated in our kitchen, and I like to see the fire so take care that the window doors are cleaned regularly. Now I wish that I had paid the extra and had the ‘brass’ handles, because I enjoy looking at it so much, it’s the heart of the home! Without any doubt I can honestly recommend it to my friends. This has been a total disaster. Burning seasoned hardwood logs, the fire usually starts up OK – thanks to a brilliant, but ridiculously expensive, Grenadier firelighter. However it takes ages to get up to a temperature that is high enough to bring in the Central Heating circulation pump. When it does, that drags the temperature back down and the pump stops again. Spoke to the supplier and they, basically, said it’s just a metal box and there’s nothing we can do. One very, very disappointed log burner user – especially as we had such promising expectations. Essentially we like the fire and the way it works. It does have to be well filled with wood, we use Douglas Fir in preference as it burns quickly and hot. Coal is also fine but costs!. The door handle does its job but is a little fiddly. Not a major issue but a minor quibble. We got a flue damper and that works well keeping the fire in all night. We have only tried this with coal but i guess it would work if you were willing to burn oak or another long lasting hardwood. It took a few days and a few fires to get lighting and control properly sorted but not that is we can do wat we need with the fire. It does take a little time to heat the water and when that is up to temperature the fire heats the room well. As I said, provided it is kept well filled with wood it is a great fire. But if you only fill it sparsely it is a less good performer. One issue which we have not yet sorted is that when the door is opened to refuel smoke comes out off the open doors a little too easily. We cannot run the fire with the doors open even if we wanted to. If anyone knows how to sort this, apart from smokeless fuel I would be gald to hear the solution. I will try inserting the metal plate in the top of the fire the other way around but if that does not solve it then we may have to get to like smoke!!! Hope not. Would strongly recommend the fire. We live in Austria where the temperatures in winter get down to -28C or worse. We have about 250 Sq m of living space, equates to a 4 – 5 bedroom house in the UK. The stove takes about 8 – 10 hours to get the whole house to around 20C from -10 (ish), which is pretty good. Once at this temperature it requires 30 – 40 Kg of coal bricks per day to keep it at temperature. 24l Oil at 1.1 Eur per litre = Eur 26.40 per day assuming heating 10 – 12 hours per day. We installed the 80 b together with an Aga intelligent heat exchanger so that the wood burner talks to the oil boiler. We do however have access to free wood. The heat exchanger dumps all overheat to the downstairs radiators which are all Victorian cast iron. It’s all clear about how the bars should look like in each position (multifuel vs wood). However, I’m a bit confused as the stove I have is operating opposite to how it is described in the Manual. To burn multi-fuel I need to push the handle away from me (manual says pull towards) and to burn wood I need to pull it toward me (manual says push away). Is it a batch of stoves or riddling bars Hunter manufactured that do not match the manual or is it an outdated manual or is my setup wrong?